Sugar maples were on the must-have list when we searched for a place in northern Maine to call home, so when the realtor’s ad specified “mature trees”, we asked our son, who lived nearby, to go out to have a look around. You know the story – love at first sight. An empty house needed a family, and a homesick family longed to own land again and to plant something. 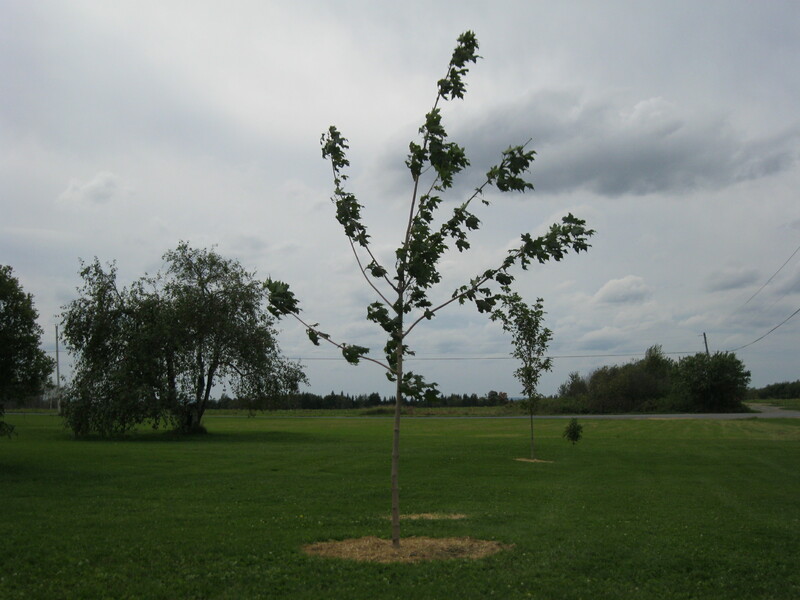 And so we planted trees that first spring, five apple trees and two sugar maples. Sam and I raced as we each dug a hole for the maples – although I don’t recall who won, such was the exuberant laughter. With the trees in the ground and a bit of land tilled for a first garden, the family settled in. 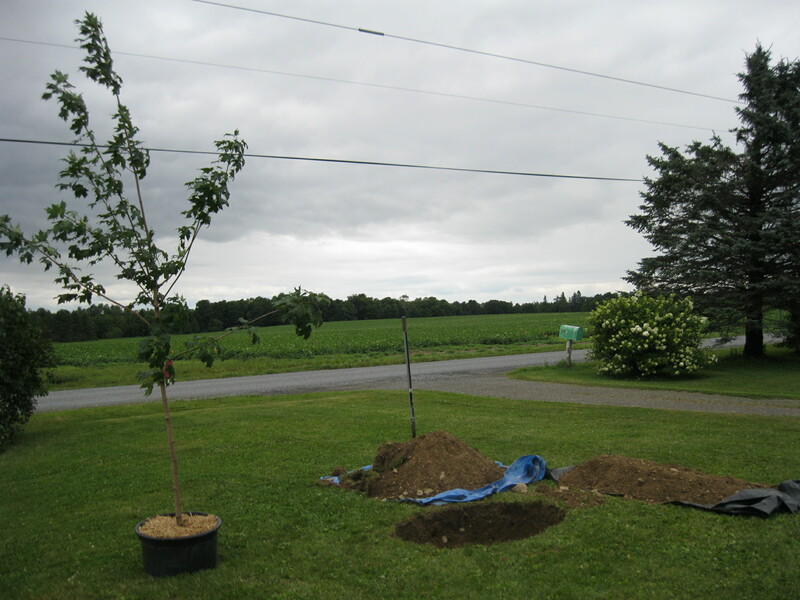 Last summer we decided to take down a dying spruce and plant a third sugar maple in its place. We bought the tree and brought it home. Knowing it would have to survive in the container until we returned from a trip, we hauled it to the east side of the house to protect it from the wind and the afternoon sun. We mulched the pot deeply with Premium Ground Cover (www.PremiumGroundCover.com), gave it a long drink, and went away for a week. When we returned, the tree looked great and the soil was still damp. Then we planted. 1. Determine the purpose of your tree – shade, privacy, food, ornamental. Choose a healthy tree hardy to your zone. Beware of signs of disease and insect damage, stress from lack of adequate moisture, or a tree which is wobbly in its pot or root ball. 2. 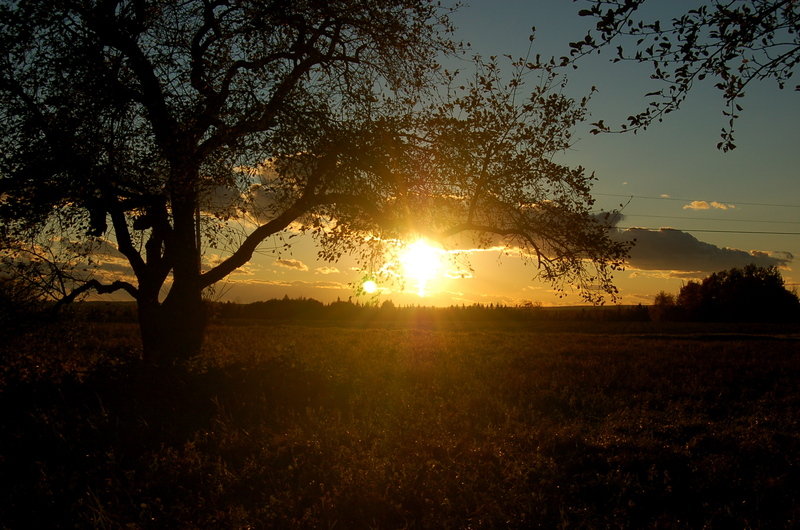 As you choose your planting location, be mindful of the sun or shade needs of your tree. Consider how windy, wet or dry the environment tends to be. Know the height and width of the mature tree. Maintain an appropriate distance from overhead wires, structures, pools, roadways and gardens which you don’t want shaded. When you think you’ve chosen your spot, place the tree there, then go into your house and look out the windows to be certain the tree will not obstruct any desired views as it grows taller and wider. 3. Take the time to dig a proper hole, generally no deeper than the tree sits in its container or root ball, but 2-3 times as wide. Shovel the soil onto a tarp, removing large rocks. Mix compost into the soil on the tarp if you wish, but at least 75% of the soil should be native to the hole. 4. Remove or cut away the container, including ropes or wires. Burlap may be left in the hole to decompose, but it must be completely buried so that it does not wick moisture away from the roots. Lay the handle of your rake across the top of the hole, and adjust the hole depth to allow the top of the root ball to be even with the rake. Encourage circling roots to point outward to prevent root strangulation. Prune off girdling roots. 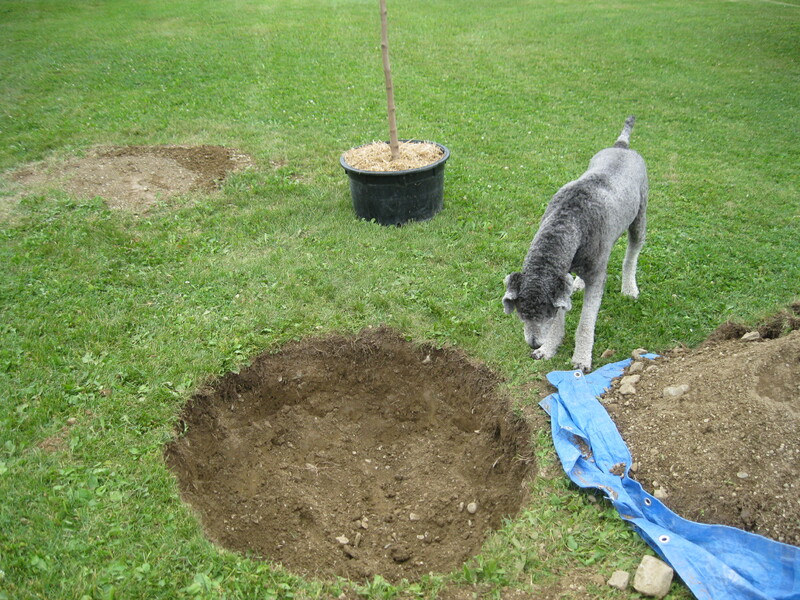 When planting bare root trees, form a mound in the bottom of the hole to raise the tree to the proper planting depth. Place the tree on the mound, spreading the roots over the mound and out into the hole. 5. Return about half the soil to the hole, tamping to remove air pockets. Roots need to make good contact with the soil. Water thoroughly as you tamp. Continue to add soil and water until the hole is filled, tamping as you go. Mulch to a depth of 2-4 inches to help maintain soil moisture and discourage weed and grass growth. Take care to keep the mulch a few inches away from the trunk of the tree. Stake only if the winds are very strong, unless it is recommended for your tree. Use hoses or straps to protect the bark from staking wire or ropes. Allow the tree to sway. Remove stakes after one year. 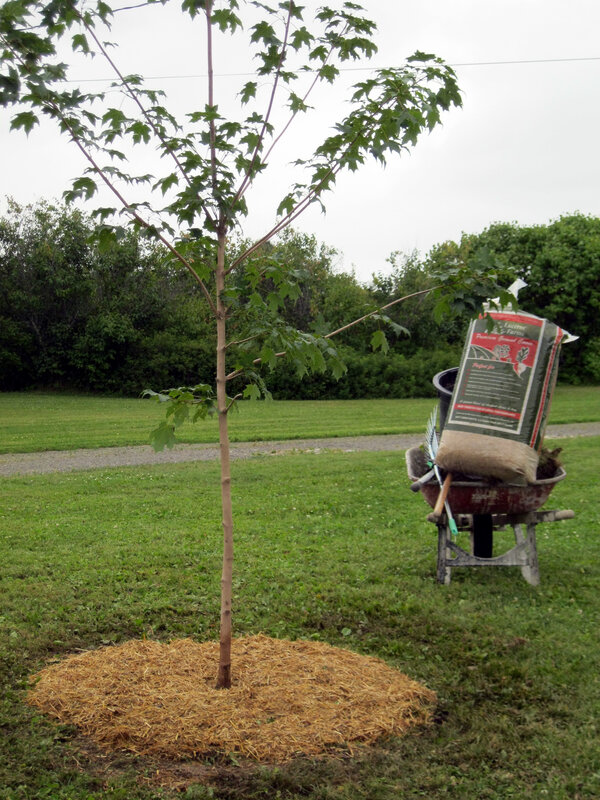 Giving your tree plenty of water is critical to its survival during the first growing season. A good way to water is to drill several holes into the sides of a 5-gallon bucket near the bottom. You can add water to the bucket quickly with your hose, but the bucket will release the water to the soil slowly. Unless we live to be very, very old, we will never tap the trees we’ve planted. Perhaps our children will make maple syrup, or our grandchildren. One day, many years from now, when sugar maples are on someone else’s must-have list, these trees will be ready. This is the story of a woman who loved a farm and had to leave it behind. 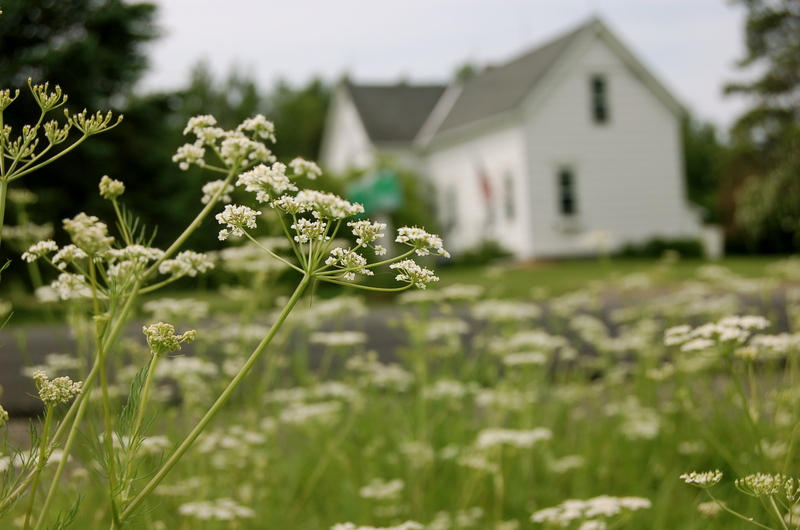 It was a small farm by the standards of some; 65 acres of gardens, raspberries, wild strawberries, fiddleheads, an old apple orchard, a new orchard, potato fields, woods and dreams. It was a farm with a hill at the center. From the house she could watch the sunset, then walk up the farm road to the top of the hill and watch the sun set again. The worst part about the leaving was not missing the house or the dear neighbors or even the moving far away. It was the aching for the land; the deep, deep longing for one piece of earth to call “our farm”. The new garden at the new house in the new town did not soothe the ache. Neither did the peach trees, nor the forsythia, nor the beds of blooming perennials. The land belonged to someone else, and even the rose bush brought from the farm refused to grow. Come along, then, for a journey as long as this is best with companions.